Dream League Dream League Soccer is here, and it’s better than ever! 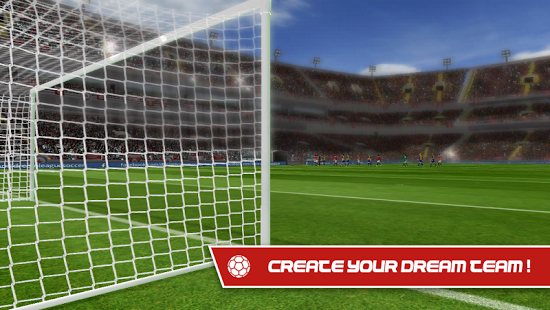 Dream League is an app created by First Touch (whose official website is http://www.ftgames.com). Dream League has a rating of 4.5 on the Play Store, with 4249235 votes. Similar apps are: Court Soccer (by free kick shooting), Soccer 2016 (by AbhiS Apps), FIFA 17 Companion (by ELECTRONIC ARTS), World Football League (by mobirix), Futbol Star 2016 World Cup (by Genera Games), REAL FOOTBALL (by Gameloft), Ultimate Soccer (by Mouse Games), Head Soccer La Liga (by Liga de Fútbol Profesional), Score! World Goals (by First Touch), FIFA Mobile (by ELECTRONIC ARTS), Real Football 2012 (by Gameloft), Score! Hero (by First Touch), FIFA 16 Ultimate Team (by ELECTRONIC ARTS). Dream League is currently available in the following countries: Peru, Switzerland, Romania, Israel, Turkey, Thailand, Germany, Japan, Netherlands, Denmark, Slovakia, Greece, Ukraine, United Arab Emirates, Poland, Estonia, Chile, Australia, Austria, Singapore, Indonesia, Czech Republic, South Korea, Colombia, Croatia, United Kingdom, France, Serbia, Sweden, Latvia, Lithuania, Norway, Finland, Hungary, Belgium, Hong Kong, Spain, Philippines, Taiwan, Malaysia, Russia, Bulgaria, India, Canada, Mexico, South Africa, Italy, Brazil, Portugal, Argentina, Saudi Arabia, United States, New Zealand, Egypt, Vietnam. Get ready for the best football in the world! Get this great game for FREE!